Always Old, New, & Interesting! The stores front windows are the first clue that one has discovered a place to enjoy and frequent for a special shopping experience. 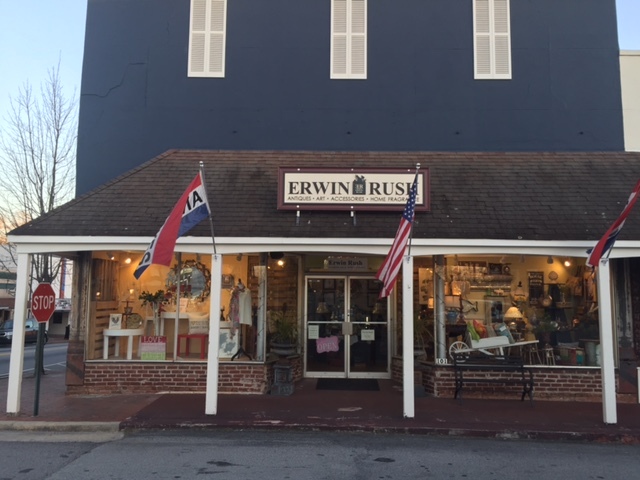 Erwin Rush opened in November 2013 as a creative retail outlet for its owner, Rush Mauney. The name is a combination of the owner’s father’s middle name, Erwin, and the owner’s name, Rush. Rush learned his entrepreneurial skills from his father and was heavily influenced by the opportunities and benefits of living in a small town where almost anything was possible. The store is a combination of antiques, art, home fragrance, and home décor. Home fragrance is an important category as Rush is a contract candle maker by trade and has developed the ever popular line of Habersham Candle Wax Pottery along with filled candles and wax-based personal care products. “Always Old, New, and Interesting” is the way Rush describes his eclectic store. Rush travels the country in search of new and different items as well as attending estate sales and auctions in search of the perfect gift. Fashion jewelry, up-cycled items, garden accessories, and even year-round Christmas add to the mix of decorative items. You’ll want to come by and get the “skinny” on our new Coconut Oil products. Easter is almost here! Come in and see our huge selection of Easter decor for you home.